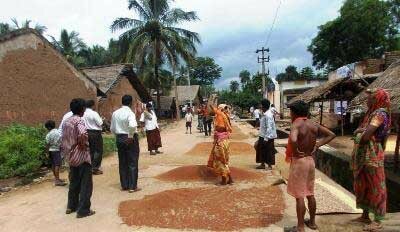 Varieties of Millet and pulses used to be grown in the hinterlands of Gajapatiby the tribals from time immemorial. These crops used to be grown on the most infertile and unsuitable lands, through their indigenous farming method called ‘slash-burn’ cultivation. Despite the adverse conditions coupled with erratic weather conditions, these farmlands provided them nutritious food to work in such harsh geographical conditions. Irrespective of rainfed agriculture, millets and indigenous crop varieties produced enough food to feed the farmers. But now only a few varieties of millets and pulses are available with the farmers, with the farmers are more inclined for hybrid paddy and maize cultivation. SACAL’s intervention on millet cultivation started way back in 2008, with 1.2 acres in Halapanka village. Under SDTT supported SRI program, millet was tried by one Salman Gamango and the variety was Bhairavi. He yielded 10 quintals per acre in the very first year following the SMI (System of Millet Intensification) method. Since then, millet and indigenous pulses and crops are being promoted extensively to secure production against the impacts of climate change and erratic rainfall. Restoring traditional food habits is another aspect to encourage food production. The local food crops including varieties of millet, vegetables and pulses are encouraged among farmers. Food fairs, demonstration fairs and seed exchange fairs are regularly organised in the field locations to spread greater awareness not only among the farmers but also among the govt officials and general population. Food demonstration camps and food serves are also being conducted at AWW centres and Primary schools. The interventions have resulted in expansion of millet cultivated land in the region considerably. Farmers are promoted to adopt system of millet intensification and line sowing methods. The production rate has also been grown considerably to 12~15 quintals per acre and the numbers of farmers have been increased to nearly 874.